Stay "up-to-date" with info & dates about book signings and appearances by author, Johnny Ray Miller. The story behind the publication of When We're Singin' continues to be about the fans. When we called Barnes & Noble at the Settler's Ridge location in Pittsburgh, the manager who spoke to us happened to be a huge Partridge Family and David Cassidy fan! She immediately went to work, jumping through hoops to get a book signing together before Christmas, and has given us the No. 1 best shopping day of the season! Books will be available for purchase and Johnny Ray Miller will be there all day, from 10AM to 10PM signing! Please stop by for this very special event at the biggest book store franchise in the nation! 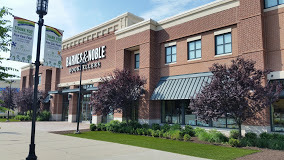 Barnes & Noble Settler's Ridge, 800 Settlers Ridge Center Drive, Pittsburgh, PA 15205. When artist Vicki Wilfrin Ricci heard about the release of When We're Singin' she went to work creating a new painting inspired by her own personal love of The Partridge Family! She titled it "Come On Get Happy" and then invited Johnny Ray Miller to do a joint book signing/art show at CHICO'S in Boardman! The event promises to be exciting and special! Join us at CHICO'S from 12 Noon to 4PM, located at 813 Boardman-Poland Road, #9b, Boardman, Ohio, 44512. Our very first book signing is scheduled at PEABERRY'S CAFE on Saturday, December 10, 2016. Hey Ohio / Pennsylvania friends...we hope to see you at Peaberry's in Canfield, OH, Sat., 12/10, from 10a-2p. Full address is: 4350 Boardman-Canfield Road, Canfield, OH 44406.